Nancy Flynn, The $100,000 Writer, shares the secrets of six-figure success with any writer eager to turn basic business-writing skills into a $100,000 income. A successful business writer who has generated millions of dollars writing and teaching others how to write, Nancy reveals closely guarded money-making secrets most writers are never exposed to. Whether you're a writer struggling to break out of freelance poverty, an experienced writer looking to supplement your income, or an in-house writer eager to start a home-based business, The $100,000 Writer can help you achieve six-figure success. A how-to classic, published in 2000, The $100,000 Writer is packed with expert advice and powerful tips that are as relevant and rewarding today as they were 15 years ago. 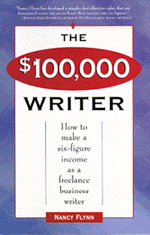 The $100,000 Writer Is Your Ticket Out of Freelance Poverty! "I SHOULD be writing to meet a deadline, but instead I am sitting here in the middle of a work day unable to stop reading The $100,000 Writer, which Amazon just delivered to my office door. What a great book, with smart guidance and a properly aggressive perspective on how to make money in a world where most writers don't. Thanks for writing it!" "I increased my income by $14,750 last year, as a direct result of Nancy Flynn's Six-Figure Writing Success System. Just one of Nancy Flynn's $100,000 Tips generated a whopping $5,000 fee for only two days' work! I can't wait to read The $100,000 Writer and put more of Nancy Flynn's Six-Figure Writing Success secrets to work." "Nancy Flynn has developed a simple but effective plan that any determined writer can use to boost their income into six figures." -Jennifer Basye Sander, co-author of The Millionairess Across the Street and The Complete Idiot's Guide® to Getting Published. How would you like to spend your days doing the work you love (writing) and generate a six-figure income in the process? If this sounds like an impossible dream, chances are you still are struggling to find your way out of freelance poverty, and you are not alone. According to a National Writers Union survey, the median income of experienced freelance writers is $4,000 a year, with only 16% of writers generating $30,000 annually. And let's face it, $30,000 isn't going to buy anyone a particularly comfortable lifestyle today. It's been my experience that writers often remain in the shallow end of the income pool not for lack of training or talent, but because of limited thinking. Eager to publish, many freelance writers focus almost exclusively on the highly competitive consumer magazine market. Bad choice. Fact is, you can make significantly more money, more quickly by selling business copy and business-related writing products to eager corporate clients. Know Nothing About Writing Business Content or Working with Corporate Clients? No Problem. The $100,000 Writer Takes You Step-by-Step Through the Process of Building a $100,000-a-Year Writing Business. Since opening my doors for business in 1988, I've generated millions of dollars in sales as a business writer and writing coach. By following the steps outlined in The $100,000 Writer, you too can achieve a writing income beyond your wildest dreams. Let me assure you that I am neither the most talented writer working in America, nor am I the product of an Ivy League business school education. What I am is an experienced business writer who has been lucky enough to write for just about every type of client imaginable. I've produced content for Fortune 500 companies, Hollywood celebrities, politicians, name-brand products, tech giants, lawyers, accountants, small businesses, entrepreneurs, mom-and-pop shops, government entities, associations, and nonprofit groups. I'm one of those rare individuals who actually loves what I do for a living, and I generate a six-figure income doing it. I challenge you to close your eyes and visualize just how satisfying your life would be if you were able to do what you love (write), and make $100,000 doing it! That dream is within your grasp, if you are willing to adhere to the plan I outline in The $100,000 Writer. Don't wait another minute. BUY NOW. Selling to the wrong person. If you want to achieve financial success as a writer, you must stop selling your work to magazine editors. Focus instead on selling content to corporate clients with deep pockets and an ongoing need for business writing. See Chapter 9 for detailed instructions on locating clients, selling your services, negotiating fees, and maximizing the profit potential of every sale. Underpricing your services and products. It's tough to set fees for writing services. A lack of industry pricing standards is one problem. The fact that there's always another writer out there, willing to undercut your fees, poses another problem. Chapter 8 reveals six-figure strategies for establishing and holding to fees. Accepting low-paying, one-time assignments. Why write a nickel-a-word magazine article when you can get paid $10,000 to write a corporate annual report? Read Part 3,and then follow the money! Failing to develop products. The only way to make big money in business writing is to stop thinking of yourself strictly as a service provider. Expand your vision to include product delivery. See Chapter 12 to learn how to create, package, sell, and resell writing products clients gladly will pay top-dollar for. Waiting for business to come to you. You'll never become a six-figure writer until you learn how to create new business opportunities, not merely respond to requests for service. See Chapter 4 for insights into finding and filling holes in the marketplace. Underestimating the power of packaging, publicity, and promotion. While most writers know how to approach magazine editors, they don't necessarily know how to sell themselves to the corporate marketplace. See Chapters 16, 18, and 19 to learn what it takes to position yourself as a big-league business writer who commands major-league money from corporations, associations, government entities, and others. Neglecting clients. Six-figure writing success rests less on writing talent than on your capacity to embrace the business side of the writing business. Read Chapter 37, then commit to make superior client service a hallmark of your writing business. I wrote The $100,000 Writer in 2000 to help fellow writers jump-start their $100,000 writing careers. Fifteen years later, this classic how-to guide remains as relevant and rewarding as ever. Some writers will see an almost-immediate, dramatic income boost solely as the result of reading and acting upon The $100,000 Writer. Other writers may need a bit of coaching to help make their $100,000 dreams a reality. That's why I am offering The $100,000 Quick-Start Audio Tape and One-on-One Coaching Programs as supplements to The $100,000 Writer. With The $100,000 Writer Quick-Start Audio Tape, you can listen and learn as I share the secrets of six-figure business writing success. This 60-minute audio tape is invaluable for writers who want to jump-start their writing income. One-on-One Coaching gives you the chance to talk directly with and learn from me, Nancy Flynn, The $100,000 Writer. Coaching programs are customized to meet your schedule and budget. Coaching is available to individuals and small groups. Contact Nancy Flynn to discuss your coaching needs and learn about our programs and fees. "The $100,000 Writer has helped me set fees, negotiate contracts, create top-dollar products and services, and deal with difficult clients. I strongly advise anyone who really wants to achieve six-figure success to invest in The $100,000 Writer. Your small investment in the book and tape will pay for itself, as you begin to generate increased fees (just like I did) as a direct result of Nancy Flynn's coaching." "Do whatever it takes (give up your daily dose of designer coffee, take the bus to work, cancel cable for a month) just find a way, any way, to scrape together the small fee to buy The $100,000 Writer book and tape. You'll learn shortcuts and secrets that will quickly put you on the road to six-figure super-success. Whether you're just starting out or are an established pro looking for an edge, Nancy Flynn's Six-Figure Writing Success System will give your income and career the boost you are looking for. Do not let the opportunity to become Nancy Flynn's coaching client pass you by." "Delivers on its promise. The title of Flynn's book makes a grand promise, and she delivers. As a person who's made a better-than-good living as a writer (and info entrepreneur) for the last 15 years, this is the one book I'd give to any of my writer friends who aspire to independence and a six-figure income. Her material on how to find clients and how to manage them once you find them is priceless. I can't imagine a better introduction to the realities of this potentially lucrative business that is a mystery to so many." "The $100,000 Writer is an extended pep talk, backed up with facts and figures. Author Flynn shows it's possible to love what you're doing without taking a vow of poverty." "Pay close attention to Nancy Flynn's advice in The $100,000 Writer. The tips on pages 110-112 alone are worth the price of the book." "Nancy Flynn converts her business writing knowledge and experience into an energetic, no-nonsense, idea-packed guide, liberally sprinkled with sidebar tips." -Angela Palazzolo, director of The Columbus Writers Conference and producer/host of Not for Writers Only! "Any business writer who wants to make money needs this book. Thanks to Nancy, I'm going to increase my writing income." "If you want to make more money, more quickly as a writer, The $100,000 Writer is for you. Nancy Flynn knows 101 ways to generate a writing income of $100,000 a year or more. I've told my writer and reporter friends all across the country to rush out and buy a copy of The $100,000 Writer." -Michael Cull, former stringer, The New York Times; statehouse bureau chief, Akron (OH) Beacon Journal; adjunct faculty member, The Ohio State University School of Journalism.